Save money and boost nutrition through a school yard garden, part of national trend to focus on eating local, whole foods. “Slow Food is an idea, a way of living and a way of eating. It is a global, grassroots movement with thousands of members around the world that links the pleasure of food with a commitment to community and the environment.” Programs like Slow Food in Schools provide grants ranging from $500-$10,000 to start a program in your school district. There are many different projects that you can customize or create for your school’s individual needs. Some of the projects suggested in the How to Start a Slow Food in Schools Project include contracting local farms to provide local produce to your school’s cafeterias, community gardens, school yard gardens, cooking classes and taste education, farmers market field trips, and farm tours. To read the stories of actual schools across the country that have participated in the Slow Food in Schools programs follow click here. For those of you who teach, attend, or have connections with a local university, check out Slow Food on Campus, a similar program for colleges. In addition to teaching our students about where food comes from, for FACS teachers, a school yard garden means fresh produce and lower grocery bills –a definite plus. Where is my gardening experience level? Do I need more skills or help to be successful? If you’ve been gardening all your life and have a significant garden yourself you’re probably all set. But what about those of us that have little to no experience growing fruits and vegetables? The best thing you can do is get help from other faculty that have more experience, befriend and/or join master gardeners, and contact your local extension agent who is funded with tax dollars to help us with these types of things! Am I willing to start a substantial project that may mean keeping it going through the summer? Unless you plan on taking the most fruitful season off….you must keep your garden going when schools not in session. My suggestion is to get reliable help for the summer months (refer to question 3). Do I have people that will help me or am I a lone ranger? Finding enough student and adult help is crucial to maintaining the garden year round. Some ways to do this are make the garden a club project or requiring a certain class or classes to maintain it. For example if it is a garden to use for culinary class have your culinary students maintain it. 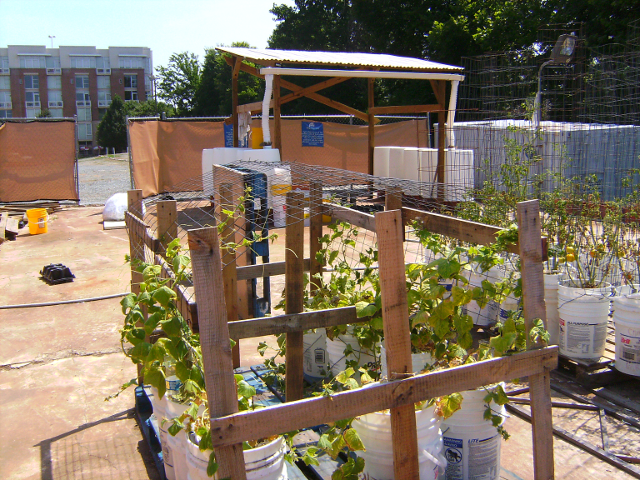 Besides culinary classes, you can pretty much make the school yard garden fit into your other courses as well. For instance if you have a child development preschool you can have the little kids plant seeds with the high school helpers. If you teach life skills you can incorporate a unit in buying food starting with the garden, going to local farmers markets, along with meal planning and grocery shopping. If desperate for help you could make it more of a community garden asking boy scouts, girl scouts, 4-Hers, etc. to help take care of it periodically. Do I live in a school conducive to gardens or does my location present challenges? For those of you who teach in the city gardening can present more of a challenge. 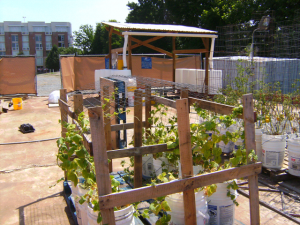 The picture above is an urban garden created by Johnson and Wales in Charlotte, North Carolina. As you can see from the pictures they plant everything in buckets (recycled food service buckets) because all they have is a cement slab. They also compost all their food scraps to create the dirt for the plants. Besides the plants, in this cement slab compound, they also installed several holding tanks to collect rain water. If you live in states that are colder for most of the school year there are several options. My school grows herbs in the window boxes. There also is the option of purchasing or building a green house.